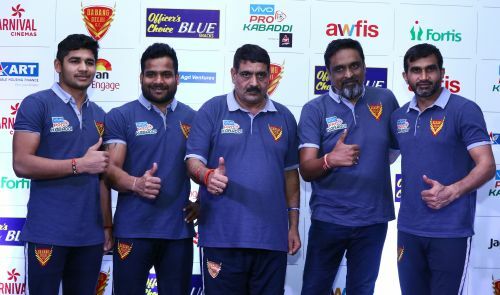 Dabang Delhi's chief coach, Krishan Kumar Hooda on Thursday praised his team's performances in season 6 of the Pro Kabaddi League ahead of Delhi's home leg fixtures. "We have had some amazing performances till now in the season but have lost several matches due to the luck not being on our side. The matches against UP Yoddha, Patna Pirates, and one more match were neck to neck which could have gone either side." He sounded very confident ahead of the home leg and continuously repeated the fact that the Delhi-based franchise has played four less games than the third-placed Puneri Paltan. "We have committed some mistakes in the last minute which cost us matches. In the home leg, we will try our level best to win six out of six matches and close the gap on Puneri Paltan who have played four more matches than us as of now." The Rohtak-born coach also admitted that the top two (U Mumba and Fortune Giants) are out of sights now but the third-placed side can easily be overtaken if the side puts a string of good performances together. When questioned about the poor performances from one of their expensive buys, Chandran Ranjit who cost a massive INR 61.25 Lacs, the coach took a defensive stance and said that he will be sticking with him to support Naveen Kumar in attack. "Naveen has been much better than any of our other raiders. Chandran Ranjit has been performing poor off late, especially since the last two matches. In the home leg, the 18-year old Naveen Kumar will be our first raider with Meraj Sheykh, Shabeer (Bappu) and Chandran Ranjit supporting him in raids." Dabbang Delhi kick off their home leg with a match against Jaipur Pink Panthers on Friday at 8 PM and will also be facing U Mumba, Puneri Paltan, Telugu Titans, Bengaluru Bulls and Tamil Thalaivas over the next seven days.